Does the DAP Collar Work to Reduce Stress and Maintain Calm? 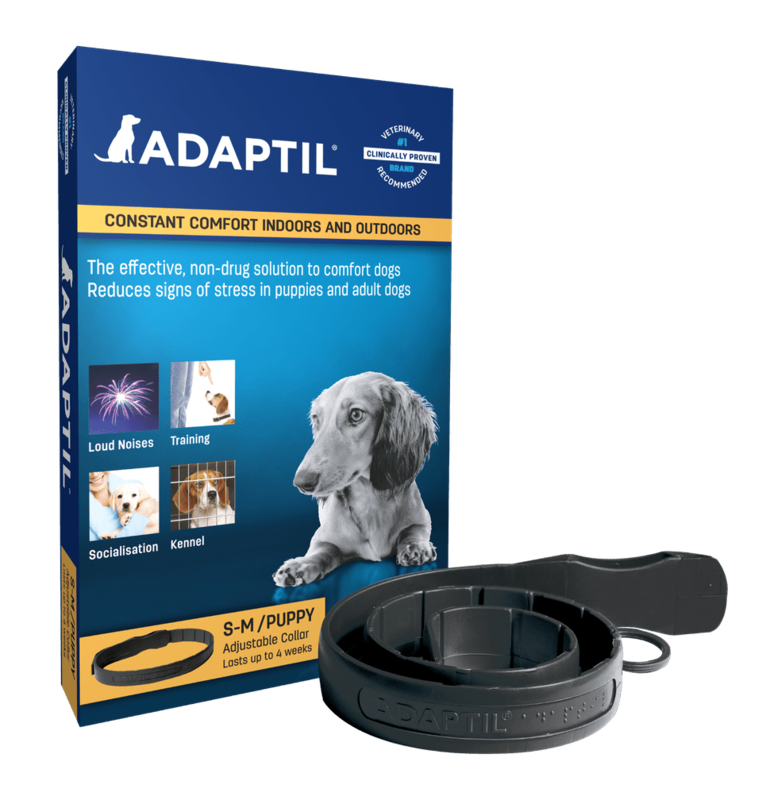 The Adpatil (formerly called DAP) collar is something to consider for a variety of canine behavior problems, including noise phobias, separation anxiety, territorial behaviors, new people or pets, car travel anxiety, and any time there are "unpredictable" events that your dog may react to. Something worth noting is that, with any behavior modification, it won't solve issues overnight, and it isn't always a 100 percent change. It was a marked overall improvement in reducing dog's noise phobias. It also helped with separation anxiety (used Adaptil spray for added benefit). The dog we tried the product on is better able to calm herself, instead of ramping up, after a loud noise. Easy to use, non-toxic, no side effects. The collar lasts four weeks, so that should be figured into collar cost. The collar buckle was a little difficult to adjust. Adaptil is a synthetic version of this pheromone, called Dog Appeasing Pheromone. The pheromones are embedded in the plastic collar. The dog's body heat helps emit the odorless pheromone from the collar. Collar size is adjustable with a small plastic buckle. After fitting the collar comfortably around your dog's neck, trim off the excess. The collar will not work when it is wet. In windy conditions, it is less effective. Adaptil is odorless and species-specific: it does not have any effect on cats, humans or other animals. The collar was put on the studied dog (who had a history of anxiety around loud noises) three days before the 4th of July. A few days before the 4th, fireworks started. With the windows closed and TV on, the dog was asleep on the floor, despite an increase in noise and frequency, occasionally lifting an eyelid for really loud bangs. A week later, there was a two-hour thunderstorm. While the dog was alert to this in the early dawn, after closing the windows, she was calm and asleep again. The separation anxiety piece wasn't as dramatic, but improved remarkably with time. For this, the collar and the Adaptil spray was used when the dog was in their crate with a Kong toy. After a few trials, they are now calm in their crate, no whining. The dog is a mild noise phobia case at this writing, and Adaptil is effective for them. Adaptil may also be used safely in conjunction with other therapies. Are You Driving Your Dog Safely?